Hello all! I've returned with a fresh batch of songs curated just for you (lies, it was mostly for me). Firstly, there's no clear theme this week, it's an eclectic roundup. I do, however, want to touch on my recurrent bias towards the 'urban jazz' genre. If you haven't noticed, and I doubt that you have, a lot of the music I listen to has jazz undertones. So, it might be time for me to define the genre in my own words. Let’s refer to urban jazz as: 21st-century music that appropriates traditional or experimental jazz. The reason my informal definition is this vague is that 1) there is a lot of music that draws from jazz, but exists in an almost oppositional genres 2) I want to leave room for us to rework the definition if need be. I wrote an article a while back about artists that father this electronic 'nu jazz' movement (i.e. Squarepusher, Flying Lotus). This trend is essentially an electronic interpretation of jazz harmonies and rhythms, but despite having this label of their own I also consider them urban jazz artists. It’s not limited to acoustic uses. Now, for this roundup, the tracks that fall under 'urban jazz' are Spilling Into You & Tried. In both cases, I can hear that these artists have jazz backgrounds which they've reworked, recycled and adapted into their unique styles. Alright, let's get to the reviewing. It would be a lie to say that I am rounding up these songs based on purely objective admiration. I'm certainly biased towards Sir Robert Bryson Hall II (a.k.a Logic) even though he is a moderately praised rapper. You're either a musical zealot who knows his entire discography or a follower that's heard a few hits— there is no in-between (I am the former, by the way). Everybody Dies is the epitome of why I fell in love with Logic's music. In this song, he brings back that 90's hip-hop, raw, masculine, fast-paced flow that is completely untainted by trap. Produced by 6ix & Cubeatz, this track is second on his newly released album Young Sinatra IV (stylized as YSIV). 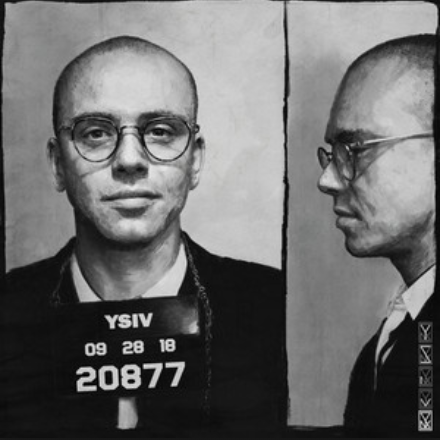 'Everybody Dies headlined as the opening track for Logic's announcement of YSIV. Young Sinatra IV is the fourth installment of the Young Sinatra mixtape series, the last of which dropped five f'ing years ago. But no fear, Logic has been releasing an album a year since. YSIV is drenched in boom-bap beats, throwbacks, and a FULL WU-TANG CLAN collaboration, which is nuts. If you're a real hip-hop head, this album meets all your needs. Oh! and go listen to YSIV it was the nominee for the roundup. I just discovered Poppy Ajudha, and I'm convinced she's an angel. This Deptford, South London-born soul singer has taken me to heaven, kissed me, and brought me back to life all in one song. Spilling into You featuring British rapper Kojey Radical is the second song from her first EP 'FEMME' released in February. Dealing primarily with issues of race and gender, Poppy expresses her politics atop the softest, most welcoming bed of soul. She describes this particular track as love from “a feminist perspective." Her vocal style is this free-form flow with the most devastating, heart-warming quality. Kojey's verse doesn't add much to the piece, I feel, but I begrudgingly accept it. Produced by electronic producer Ben Hayes, the track is a lovely mesh of minimal electronic sounds and jazz instrumentals. The melody line that immediately pulls my attention (excluding Poppy's voice of course) is the lazy, bass line that becomes clear as Poppy starts her first verse. Her soul-infused sound has put her at the forefront of south London’s flourishing jazz scene, which explains why she is currently touring with Tom Misch (a pioneer in the urban jazz genre, in my opinion). For now, I'm listening patiently and eagerly for her next project. Nice to meet you, Poppy. It seems we're alternating between gritty hip-hop tracks and soulful jazz tunes. This gritty hip-hop song features two of Washington's best, Dave B. and Sango. I Rhymed King with King is a short and sweet 1: 29-minute lyrical rollercoaster. The track samples Dat Brat's 2000 single That What I'm Looking For, and over it, is Dave B's quick, playful and witty flow. Sango does a great job of building Dave's intensity and then bringing him back to this laid-back, choppy rhyme scheme. Excluding Dave B. 's verse, I thoroughly enjoyed the opening monologue, which is this hilarious recording of man (working on finding out who!) telling us how to properly make mac n' cheese. I Rhymed King with King comes off Dave's upcoming album BLEU which he announced in August, so hopefully, it's set to be out soon! If his last two releases were any indication, then this upcoming album is worth the wait. 4. TRIED: BADBADNOTGOOD & Little Dragon. As I mentioned above, I am always going to be biased towards my favorite artists; Little Dragon (next to Hiatus Kaiyote) is my favorite band. I've been listening to them since I was 14 (when I sang After the Rain), and have never gotten bored with their music. BADBADNOTGOOD is not a favorite band, but I have been following them since the release of Sour Soul with Ghostface. Both BBNG and Little Dragon consists of trained jazz musicians, both of which have received a multitude of praise from the jazz community (Little Dragon may be dubbed more experimental electronic). BBNG is much more than a jazz trio, that's the foundation, but what they've done with their sound is truly unique. Knowing them both well, it's surprising to me that they've released such a simple track (simple is not a bad term here), especially for their first collaboration. It was a matter of time before Little Dragon and BBNG collaborated, so in some sense, I've been anticipating this release for a while though I can't shake this feeling of disappointment. The piece is a beautiful, woeful ballad; it has the staple BBNG guitar riffs and Yukimi Nagano’s soft-soul vocals. The chorus is catchy, but it's a passive track in comparison to each of their discographies. It may be because they collaborated across continents but Tried feels incomplete to me. Even as I type the words, I feel as though I am betraying Yukimi’s, but I know they could have done so much together I'm not saying the song is terrible, but as a fan, I wanted more. This is a weighty track. Nay, this is a weighty album. Released earlier this year, CARE FOR ME is Saba's most emotive compilation yet. It comes a year after his cousin and frequent collaborator, Walter “John Walt” Long Jr.was stabbed in Chicago. The grief-stricken rapper channeled himself into this album and the outcome is worth experiencing with him. 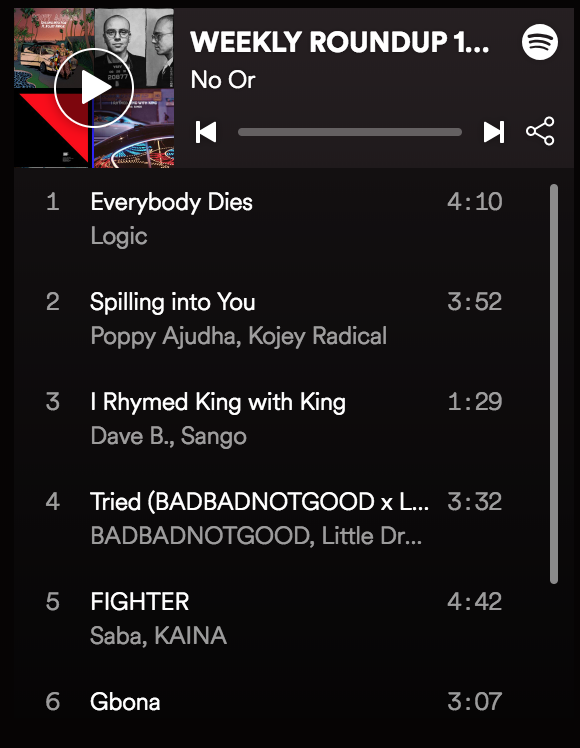 FIGHTER is the halfway point of CARE FOR ME, and Saba switches to this storytelling style with a structureless flow and a roundabout rhyme scheme. It's as though he just sat down to tell us a story and got pulled into it himself. The production is idle, Saba's flow is as free-form as the instrumentals which have very loose chorus/verse sections. The album is composed entirely by Saba with producer DaedaePivot and multi-instrumentalist Daoud. SABA likes to stick to his circle of collaborators in Pivot Gang, the West-side Chicago music collective that Saba, TheMind, Kaina, Noname Daoud, daedaePIVOT and Chandler, his father are all a part of. FIGHTER also features another member, Kiana, who appears as an echo to SABA in his chorus "I don't want to fight no more, cause I'm not a fighter". The song winds down and completely shifts at 3:31 minutes. Now, we're listening to a more familiar Saba trap sound, it's an entirely new song at this point. Saba's vocals transition to this submerged, low quality that seduces me into waiting for the next track. I'm not sure what inspired this shift, but I like it, I wish it wasn't so short lived. Damini Ogulu, better known by his stage name Burna Boy, is back with yet another fervent single! Gbona is the most recent release since his album Outside. Alongside the track, we also have a music video which he dropped last week. Unlike some people in this roundup, Burna Boy is one of those artists that both never disappoints but also never surprises you (depending on who you ask that's a good thing) Before Gbona, Burna's hit single was Ye; the track got a huge boost in streaming numbers since it has the same title as Kanye's album ye. This Nigerian-born is affectionately referred to as an Afro-fusion artist which comes across in this new track. Gbona isn't a straightforward afrobeat tune; Burna performs his familiar free-form vocals atop a compelling production. The signal that this piece is fusion is the saxophone, this little sprinkle of jazz atop a lazy island beat. Note, having this saxophone in his track is reminiscent of Fela Kuti's trademark afrobeat sound. All in all, I'd rank the track a 7/10. Not only is Kaytranada famous for his bouncy beats, but he's also known to reanimate dispirited tracks with a compelling remix. The most recent reviving was plucked out of UK Singer's Kelela's debut album Take Me Apart. This "Waitin" remix is titled "KAYTRANADA_WAITIN_115 BPM" as part of a larger upcoming remix compilation titled TAKE ME A_PART, THE REMIXES. Kelela is building a name for herself in the UK's progressive R&B scene, working alongside Bok Bok— British producer and founder of record label Night Slugs. Kaytranada gives her song Waitin this peculiar jangle and the track doesn't drop the way most Kaytra's tracks do. This Quebecers Dj teases us for a whole 2 minutes with ambient instrumentals, sparse piano lines and, Kelela's reverbed verses before he drops that trademark Kaytra beat. This remix is not Kaytra's strongest, in my opinion. I don't know why he waited so long to capture our attention, but Kaytra is the type of artist that is always experimenting with the limits of his sound. He does so by keeping us engaged and frequently releasing new music. I already covered a new Kaytra track in my first roundup and here he is again. So, I'm sure there will be a new song soon and I'll forget all about this mediocre remix.